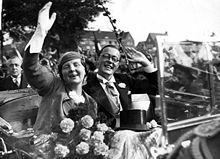 In 1937 Princess Juliana van Oranje-Nassau (she became our Queen later on) and Prince Bernhard van Lippe-Biesterfeld got married and on their honeymoon they visited the south of Poland. Piwniczna – Zdrój was one of the places they stayed and right over there an exhibition on the visit of the Princess and Prince will be opened on December 10th by Ambassador Ron van Dartel, in the Pijalnia Artystyczna in Piwniczna Zdrój. Next story „Labyrinten. Geheugenprints” – wystawa prac Mariana Kołodzieja w Muzeum Historyland w Hellevoetsluis od 13 stycznia 2018.